Innistrad Booster Battle Packs… and a Giveaway! Not only does today’s piece update the product for Innistrad, giving you ten similarly-themed packets to play with, but I’m also giving away the finished product! In the hullabaloo with the impending release of Innistrad and all the spoilers that go with it, the recent launch of a new Magic product- the Booster Battle Pack- seems to have gone largely unnoticed. A new limited product, the phrase “deck of semi-randomized cards” in the marketing blurb got our attention. If they are only semi-randomized, does that make them to some degree planned? And if they’re planned, could that put them in the realm of preconstruction? Close enough, we thought, and picked one up to investigate. 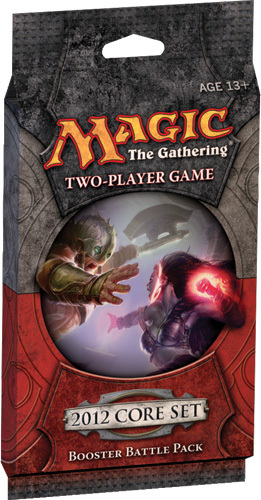 The Pack consists of two cardboard deck boxes, and within each deck are four things. First, a booster pack of Magic 2012. Next, an insert (either the “Booster Battle Pack” tutorial or the ubiquitous “How to Play” one). Finally, there were two plastic-wrapped packs of 10 cards, each containing five cards of a single colour and five corresponding land cards. The object is simple- take your deck of 20 cards, then open the booster and add five more of your choice. Shuffle up, and you’re ready to go! Jimi and I sat down to test them out and put them through their paces. For my part, my base cards were Red and Green. I opened the Red first, and noted that there were four commons and one uncommon. My base was interesting: a Fiery Hellhound and Firebreathing each gave me a way to turn extra Red mana into damage, though these are always somewhat constrained in a deck playing more than one colour. But aha, a trick! 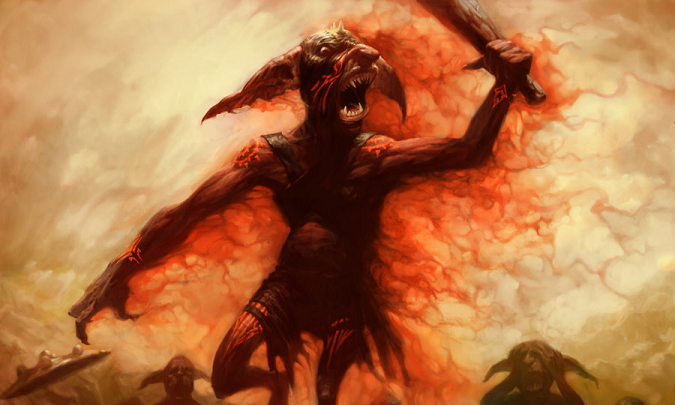 There was a Goblin Tunneler present as well, which gave me some sneakiness as I could make a creature unblockable, attack with it and then pump up its power. Devious!